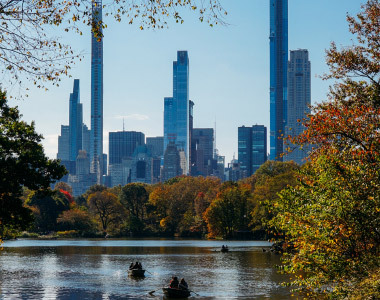 The Central Park North is located right in the heart of New York City only a 5 minute walk from Central Park – one of New York’s defining landmarks. Fifth Avenue and Central Park West are just around the corner. Located in a beautiful 19th century building, our Inn has been newly renovated, and comes with many amenities to make your stay as comfortable as possible. Our Inn is located just a 2 minute walk from 2 subways – Cathedral Parkway with the B and C trains and Central Park North with the 2 and 3 trains making our location convenient for getting practically anywhere in Manhattan within just a few minutes. The express trains located by our building offer connections to most areas of Manhattan including Times Square, the Theater District, Greenwich Village, Soho, Chelsea and more. Every room has cable television and high speed WiFi Internet access and most have a work area. Each room comes with air conditioning making it comfortable during any season. Many of our rooms come with kitchenettes and all of the kitchen equipment necessary to make your own meals. Everywhere, the ceilings are high and the colors of the rooms are light allowing our guests to relax after a long day of sightseeing or work. Because of its fantastic location, friendly staff and amenities, The Central Park North is the perfect place to stay to experience New York City's rich history and cultural heritage.